Our range of products include solar hybrid wind mill. 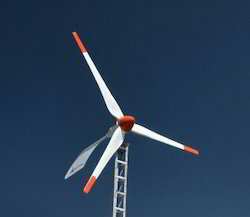 We offer Solar Hybrid Wind Mill as Green Energy solution. The power source of a Solar Hybrid Wind Mill system is natural wind and solar radiation. This Solar Hybrid Wind Mill system is more cost-effective and reliable in the wind available zone. The whole system can also be used for home power generation and capacity will depend on load.